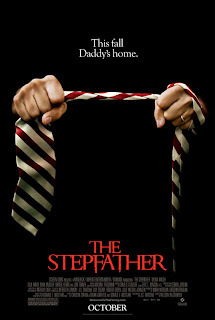 The Billionty-Oneth Geek: THE STEPFATHER!!! Okay, so this movie was bad, let's get that out of the way. It was a waste of time on my part, for taking time to watch it, and on their part, for taking time, money and effort in making it. Three key reasons come to mind. I think it was a mistake to show that the stepfather was a murderer from frame one. Right off the bat, we know he's a killer which takes away from a lot of the mystery that they could have built. I mean, we know from the trailers that obviously this stepfather is an evil dude, but there's no sense of suspense to it. The only "suspense" out of it are all the times the stepfather pops up in random places to scare the kids. It's not scary at all and by the third time, it comes across more as comedy to me. The second flaw, which is closely related, is the lack of motive for said stepfather. He just kills for the sake of killing, there's no rhyme or reason. He's just as mindless as Jason Voorhees from Friday the 13th or the birds from Alfred Hitchcock's The Birds. The last mistake was the ending or the lack thereof. Nothing is really resolved, making the one and a half hours that you spent watching it, mean nothing. Clearly, the director must have had some sort of crush on the young lass, Amber Heard. The camera was literally making love to her anytime she was onscreen. Also of note, she was half naked throughout the movie. It'd be fine if it was just one scene, but when it happens throughout the movie, it becomes a bit ridiculous. I mean, do girls really walk around in their underwear or bikini everywhere? I don't think that they do. But if they do? Then: jefftlam@gmail.com. One such scene. I feel odd complaining. So don't watch this movie. There are so many other fun and good horror flicks out there, especially coming out of 2009, rendering this as pure garbage. Later geeks. Looks pretty ghetto! I think I will avoid this one as per your advice Jeff! Hi, ur blog is really nice, I truly like it. I just wanna suggest that u should go for blog advertising & marketing there is a website which is offering very unique features at affordable prices there are expert advertising team who will promote ur blog & affiliate ads through all over the networks which will definitely boost ur traffic & readers. Finally I have bookmarked ur blog & also shared to my friends.i think my friend might too like it hope u have a wonderful day & ! !happy blogging!!.. Thanks... I think? Seems so sketchy and copy & pasted.